1 of 4 With a serrated steak knife, slice tops off tomatoes; reserve tops. Using a small spoon, scoop out flesh and seeds from centers, reserving about 1/2 cup flesh. Rinse out tomato shells; let dry upside down on paper toweling. Chop reserved tomato flesh. 2 of 4 In a large skillet over medium-high heat, cook bacon until crisp, about 5 minutes. Transfer to paper toweling to drain. 3 of 4 Thinly slice iceberg wedge into fine shreds; chop if long strands of lettuce remain. Transfer lettuce to medium-size bowl. Stir in reserved chopped tomato flesh. Add the shredded cheddar cheese, mayonnaise, vinegar, Old Bay seasoning and hot-pepper sauce; stir until well blended. 4 of 4 Crumble the cooked bacon into bite-size pieces. Stir the bacon into the lettuce mixture. Place tomatoes upright on platter. Spoon filling into tomatoes, mounding slightly. Replace tomato tops. 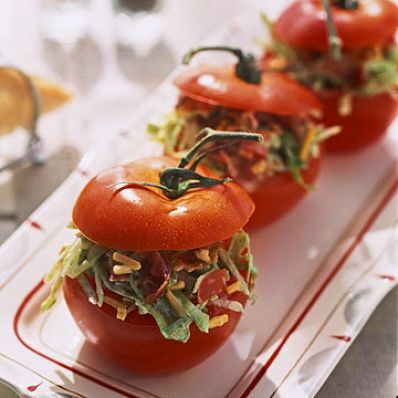 Serve the stuffed tomatoes immediately.